A sweet, engaging, contemporary YA novel that explores living with anxiety and navigating first love. If you’re looking for a story that will warm your heart without too much darkness this is the book for you. I was lucky enough to have been able to purchase this terrific Australian YA novel back in March, and finished it in a single evening. Inside my copy Kylie Fornasier wrote ‘Warning: There is kissing in this book’ and stuck a post-it-note on page 279 with a secret message. The note related directly to the story, and it’s definitely one of the sweetest and most thoughtful additions an author has made to a book I own. But if Kylie being a lovely human isn’t enough to make you want to read this book then read on! 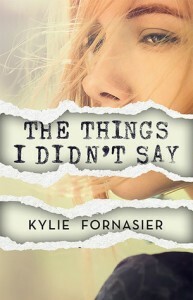 The Things I Didn’t Say is about Piper Rhodes, a teenage girl with Selective Mutism. This rare anxiety disorder renders sufferers unable to speak in the presence of others, but particularly strangers or in confronting situations. I’d never heard of this particular disorder before, but I have plenty of first and second hand experience with other forms of anxiety, and the way in which Piper’s story unfolds rings so true. The book begins with her move to a new high school, and her hopes for a fresh start. Piper’s struggle perfectly captures the helpless, trapped feeling that characterises anxiety, regardless of its manifestation. She slowly and hesitantly navigates building new friendships and nurses a growing crush on West, the boy who seems to have it all. From the very beginning it is clear that the story is going to be about Piper and West. It seems both natural and cliché for the girl who cannot speak to build a relationship with the most popular boy in school whose life isn’t as perfect as everyone assumes. Despite the fairly predictable narrative arc the story is really enjoyable. Piper and West’s relationship grows gently and without too much of the frustrating miscommunication and angst that infuriates me in so many YA novels. The instances of bullying are explored with finesse, and there were a few moments towards the end where I wanted to cheer out loud for the characters. My biggest frustration with this novel was that Piper’s relationships with people other than West and her family were left largely unexplored. Cassie, who was her best friend and the main reason that Piper wanted to change schools to escape, following an incident at a party, is mostly neglected. I can appreciate that Piper is taking time to heal that relationship, but their connection never really felt genuine. Piper’s friendship with Tanvi is much the same, and I had really hoped to have a scene or two where their bond is explored, as it felt like most of their growth was taking place ‘off screen’. The Things I Didn’t say is a great example of a YA contemporary. It’s funny, touching, tackles big issues with care, and is written from the heart. Suitable for ages 14 and up.